New alpha, fewer bugs, better visuals. That just about sums up the latest update to the co-op puzzle adventure game BFF or Die. Honey Tribe Studios continues to tinker with its tongue in cheek title that focuses on getting players to work together for the greater good. And if they don't? Well, the title pretty much answers that question. BFF or Die puts up to four local players in control of time traveling aliens lost on Earth in ancient Egyptian times. They're trapped in dark dungeons, you see, and in order to escape, they have to work together. While some players start getting through the mazes, for example, others will provide light or distract enemies. If someone doesn't pull their weight, nobody's getting home! 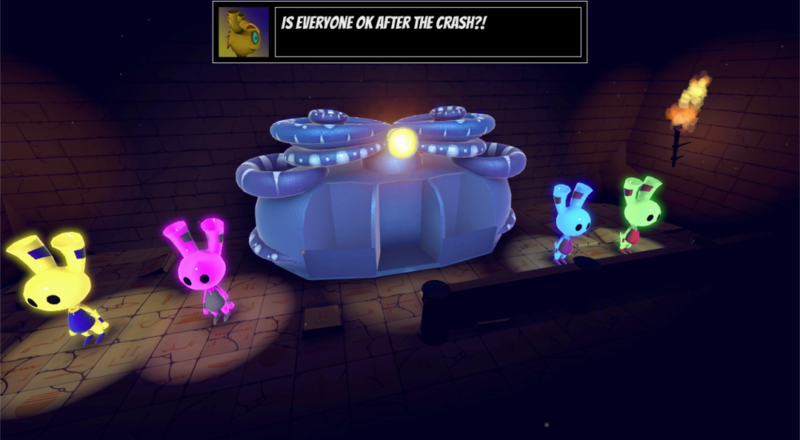 The latest update moves the puzzle adventure from Unity 4 to Unity 5, enabling a host of new visual effects. In addition, many textures have been redrawn to form a cleaner, more cohesive visual style. A single player mode has been added alongside 2-4 player local co-op, and the team even hinted at the possibility of online multiplayer in the future. Get a taste of the new BFF or Die by grabbing the free demo. You won't regret it, unless your IRL BFFs are terrible at puzzle games, that is.